This is the first post in a series on “Canada’s Anthropocene,” with posts and a roundtable by Pamela Banting, Ashlee Cunsolo, Alan MacEachern, and Joshua MacFadyen. To read the entire series, click here. Dictionary.com’s word of the year for 2017 was “complicit.” This speaks to a rising societal acceptance that those who don’t call out and reject bad behaviour – be it sexual harassment, institutional racism, settler colonialism, or Trump – share a burden of responsibility for its persistence. But complicit is a word that is more often directed outwards. Googling “you are complicit” yields seven times as many hits as “I am complicit.” “Your complicity” is bigger than “my complicity.” When I start typing “They are complic…” Google autocompletes it as “complicit,” but typing “We are complic…” produces “complicated.” We underreport or just underestimate our own complicity. It’s complicated. So I’m just going to come out and say it. The Anthropocene: that’s on me. My bad. To my mind, the Anthropocene – the idea that humans are now having such an unprecedentedly massive and for all intents and purposes permanent effect on the planet that it constitutes a new epoch not just in human history but in Earth history – is the most important new environmental concept this century. Like “Gaia,” one of the most important such terms of the last century (or “ecology,” for that matter), part of Anthropocene’s significance lies in it being applied both literally and metaphorically. On the one hand, it refers to this period of unprecedented disruptions in the Earth’s systems, to the point that the International Commission on Stratigraphy is now considering whether to accept its working group’s recommendation that the term be formally adopted as a new geological age. On the other hand, the word also appears regularly in the broader culture as a means of expressing contemporary human dominance of the planet generally, most often in negative if not cautionary if not apocalyptic terms. But unlike Gaia or ecology, the Anthropocene concept is also significant because, by virtue of its intrinsic temporality, it is an historical term. If we are in the Anthropocene now, when did it arrive? What set the snowball rolling? Scholars may debate whether the Anthropocene is best dated to 1945 (both generally for the beginning of a “Great Acceleration” of the rate of human impacts and specifically for the launch of the nuclear age, and the resultant radioactive signature in “our” geological layer), the late 18th century (the beginning of the widespread use of fossil fuels, with all the attendant changes that has brought to our atmosphere, biosphere, and hydrosphere), or even earlier, but that it is an important new way of conceptualizing and periodizing history is clear. The fact that the Anthropocene is inherently historical has the potential to influence how society thinks about environmental concerns, and its complicity in them. My sense is that most people have tended to think about such issues in relation to two groups of people: those of other nations (“Our country produces/consumes less/more than that country”) and those of the future (“What planet are we leaving our children?”). But the Anthropocene calls us to compare ourselves to a third: those of the past, and the very recent past at that. Writing in 2014 of the Great Acceleration, J.R. McNeill and Peter Engelke note that the period since 1945 corresponds roughly to a human lifespan. Surprisingly, though, they state this for the purpose of arguing that most of humanity today has lived only during a highly anomalous moment in human history. But for historians at least, surely the unstated corollary is just as remarkable: that among us today there lives a small number of people who were witnesses to an entirely different historical – even geological! – epoch. Just as military historians interview veterans of a war before the last one dies out, this should be a call for environmental historians to fan out and interview veterans of the Holocene. My father is such a veteran. He was born into a world that had fewer people than China and India have between them today. The Prince Edward Island farm on which he was raised had no electricity, no automobile, no tractor, no chemical fertilizers. More to the point, this was not unusual for much of the world. In his lifetime he has experienced – and, more often, went out of his way to avoid – dramatic changes in how humans live on the planet. Take air travel. After a long line of flightless MacEacherns, he has flown – twice. But it’s my flying in comparison to his that truly demonstrates the hockey stick-shaped trajectory of the Anthropocene. Based on all the flights I can recall, I calculate that I’ve flown about 388,000 km – nearly ten times around the globe at the equator. That is … astonishing. That means that my airplane travel alone has generated roughly 35 metric tonnes of carbon dioxide emissions (that is a per passenger calculation and does not take into account the additional impacts that occur when greenhouse gases are emitted at high altitude). It takes the average Canadian almost two years to emit that much. Or the average Indian sixteen. When I compare my carbon footprint to my father’s or grandfather’s, I can’t pretend I am not just living in, but complicit in, the Anthropocene. My family’s case may not be representative: maybe your Mom’s a pilot and you’re acrophobic. 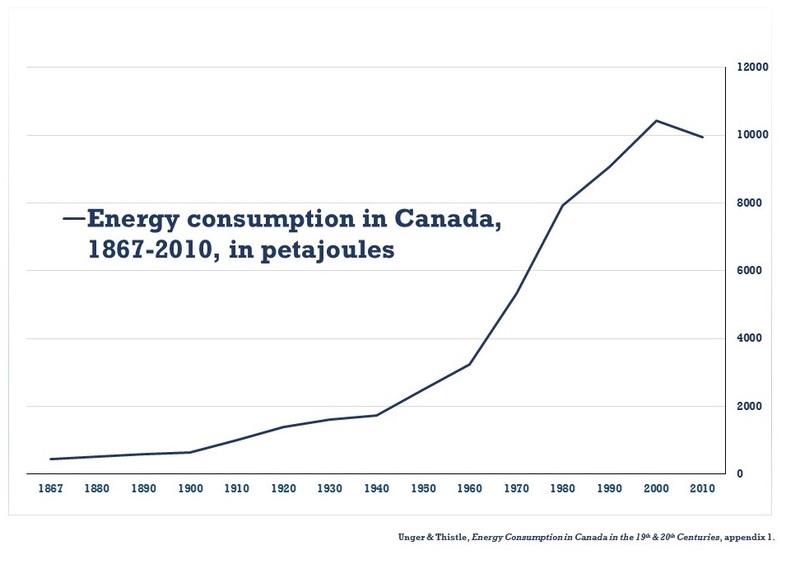 But the vertiginous rise in energy use during the Anthropocene is true for Canadians generally, to the point that we now use almost twice as much energy as the average European, and one hundred times that of people in many African countries. Indeed, Canada is young enough as a nation, and its growth in population, industrialization, agricultural land use, fossil fuel consumption, resource extraction, etc. etc. etc. is so in tandem with the global Anthropocene – defined in either post-1945 or post-1800 terms – that we should consider ourselves a prototypical Anthropocenic nation. A “born-Anthropocene” nation, even. Even if we don’t turn to interviewing Holocene veterans, Canadian environmental historians should be researching, writing, and teaching our nation’s history as that of a people mining, utilizing, transporting, and consuming the Earth’s resources in a way and to a degree that no previous people ever had before. We are complicit in the Anthropocene, and need to be complicit in writing about it. This post springs from “The Canthropocene,” a thread I wrote as part of 2017’s #Beyond150CA Twitter conference. On the Anthropocene, see Paul J. Crutzen and Eugene F. Stoermer, “The ‘Anthropocene,’” Global Change Newsletter 41(2000), 17-18; Ian Angus, Facing the Anthropocene: Fossil Capitalism and the Crisis of the Earth System (2016); JR McNeill and Peter Engelke, The Great Acceleration: An Environmental History of the Anthropocene since 1945 (2014); Christophe Bonneuil and Jean-Baptise Fressoz, The Shock of the Anthropocene: The Earth, History, and Us, trans. David Fernbach (2016 ); and more every day. To be sure, the malleability of the term, as with Gaia and ecology, has been frustrating to those wanting to retain its scientific precision. Bonneuil and Fressoz are useful in showing how the timing of Anthropocenic growth is ultimately related to one’s frame of reference (28). For example, when global CO2 emissions are measured 1750-1900, in 1000s of metric tons, the beginning of the steep rise seems to occur around 1880. But when they are measured 1750-2000, in 10,000s of metric tons, it occurs around 1950. Environmental historians were presumably ahead of the curve, and more historically-minded about environmental issues than the broader culture. If it seems I’m kidding …I am, some. But I do believe that the Anthropocene offers historians both an opportunity and an obligation to document and analyze this transition to a new period in earth’s history. Although dated, see Intergovernmental Panel on Climate Change, Aviation and the Global Atmosphere, 1999, as well as Canada’s Action Plan to Reduce Greenhouse Gas Emissions from Aviation, 2017. My calculations are necessarily inexact. Long flights tend to be more fuel efficient than short ones, because a disproportionate amount is burned at take-off and landing, but longer ones also tend to be at higher altitudes, with emissions having greater effect on climate. 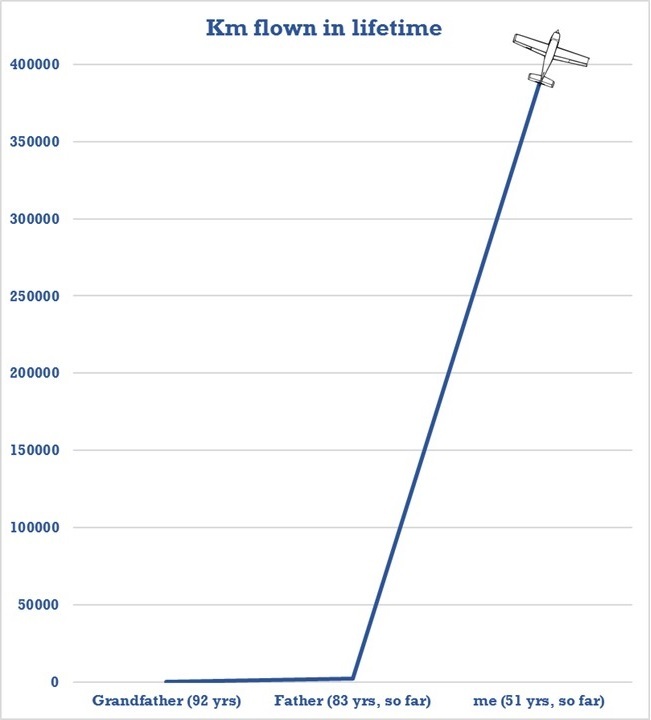 Airplanes have also become much more fuel-efficient over the course of my lifetime. I used WebFlyer to determine how far I’ve travelled, based on remembered flights to Aberdeen, Amsterdam, Baton Rouge, Brisbane, Calgary (4), Cayo Largo, Charlottetown (estimated at 15), Denver, Durham (2), Edinburgh, Halifax (2), Helsinki, Holguin, Houston, Kelowna (3), Las Vegas, London, Madison, Munich (3), Ottawa (5), Phoenix, Portland, Reykjavik, San Francisco, San Juan, Saskatoon, Seattle, Tallahassee, Toronto, Vancouver (2), Victoria, Wuhan. If you saw me somewhere else, and it’s more than three hours from London, Ontario, I likely forgot to include it. I then treated the 388,000 km total as 48 flights between New York and Los Angeles, for which the per passenger carbon emissions have been calculated. On Canadian energy use, R.W. Sandwell, ed., Powering Up Canada: A History of Power, Fuel, and Energy from 1600 (2016). The phrase is Dolly Jørgensen’s, who writes on the theme in the forthcoming UBC Press collection Science, Technology, and the Modern in Canada, edited by Edward Jones-Imhotep and Tina Adcock.